Vila Pouca da Beira is located in central Portugal on the edge of the Serra de Estrela Natural Park. Although only a tiny village with just over 400 residents, it not only has an excellent Pousada but was also the home to the eminent Dutch writer, Gerrit Komrij, until he passed away quite recently. The Pousada de Vila da Beira (Hotel Pousada Convento do Desagravo) was formerly a convent built in 1780, and a century later was converted into a hospital. 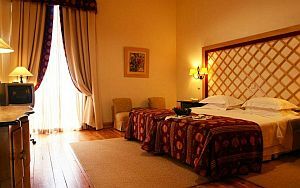 Today it is a luxury hotel with and an atmosphere that is both elegant and relaxing. Facilities include a swimming pool, tennis court, and excellent restaurant serving local and regional dishes. Being so close to the Serra de Estrela Natural Park, it attracts many visitors particularly those who enjoy hiking. The park has the highest and largest mountain range in mainland Portugal (the highest peak is found on the Azores Islands which are also part of Portugal) which means there is also skiing in the winter. When the ice age eventually melted away in this part of Portugal, it left behind beautiful lakes, stunning ravines, and valleys in the shape of horseshoes. The park covers about 1,000km and one of its steeper peaks, Cantaro Magro, has many trails that hikers of all levels can enjoy, as well as challenging climbs for the more adventurous. With regard to the wildlife, sadly bears are now a thing of the past but you will still get the occasional wolf passing through. There are also otters, badgers, wildcats and even a very rare species of lizard. The source for the Mondego and Zezare rivers that run through the park is the Serra da Estrela. Situated on the northwest slope of this mountain is the Linhares Castle which played a very significant role in the Mondego Valley. Although they cannot be sure exactly when it was built, it is believed Roman and Arab fortresses previously existed on this site. Today the castle is a National Monument with many of its ancient features remaining. Traditionally the mountain economy was reliant on agriculture, sheep and goat herding, and the production of hand-made cheese. This area is also known for its smoked produce, basket work, and embroidered cotton. In the valley to the southwest is the village of Loriga. Loriga was chosen as a site more than 2,600 years old because of its abundance water supply and excellent pastureland. The Romans left behind a 1st century road and two bridges but regrettably one of the bridges was destroyed during a flood in the 17th century. There was also a Visigothic chapel which was eventually replaced by the Matriz Church in the early 13th century. However this was destroyed during the great earthquake in 1755 as were many homes. Today only a small portion of the church remains. Southeast of Vila Pouca da Beira is Belmonte, another wonderful place to explore if you are looking for an interesting day trip. This little town is dominated by a 13th Century castle which was the birthplace of Pedro Alvares Cabral, the famous Portuguese explorer who discovered Brazil. The castle was converted into a manor house by his family during the 15th century and their coat of arms can be seen in the Manueline window on the side wall. The inside has since been refurbished and now includes an amphitheatre where concerts and theatre performances are held. In the centre of town is a statue of the great explorer. Some suggest he discovered Brazil by accident as a result of being blown off course by a huge storm whilst sailing around the Cape of Good Hope on his way to the Far East. The beloved statue of the Virgin Mary which Cabral used to take with him on his voyages can be found in the Parish Church. However his tomb, as well as the other members of his family, rests in the Church of Santiago. The old Jewish quarter is a maze of ancient alleyways and has a small museum that explains the story behind this fascinating historical quarter. Even today it still remains the residence for the largest Jewish community in Portugal. Perhaps more of a curiosity, there is also the Centum Cellas on the northeast side of town. This Roman tower has remained a bit of a mystery as none of the experts have been able to establish its exact purpose. 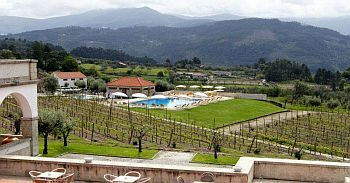 Vila Pouca da Beira may be tiny in size but this part of Portugal has a great deal to offer with stunning views, plenty of outdoor activities for those who love nature, as well as an intriguing history. Visit Vila Pouca da Beira and you will not be disappointed.